I'm not really a fan of the Fox Network's T.V. series American Idol, but I do often end up watching it if only because the wife is a fan. If she was doing something else, I'd probably stick with watching something on my old stand- by the History Channel. I'll have to admit, I agree with most everyone else that Sanjaya Malakar, the Indian(?) contestant should have been booted long ago. I can't believe he made it through the earlier rounds much less the last one. I joked to the wife it must be some kind of organized movement that's keeping him on the show. Hey, there's no limit to how many times someone can call in their vote, right? Shock jock, Howard Stern, has been promoting this site on his radio show (you need to click on the link in the upper right to get past the sponsor's page) that's trying to get people to vote for the worst American Idol contestants. Looks like it's working and that is kind of funny, but I also think it's kind of rude. Why try to ruin a T.V. show millions of people like? Still, it does go to show that some internet based movements can be effective. Thanks to the rise in ethanol use more and more corn is being planted, as has been mentioned here before. The Times- Standard had this story on the subject in their business section this morning, although I couldn't find a link to it on their web page. Hard for me to make heads or tails out of this. Some seem to be suggesting that increasing demand (coupled with more acreage planted with corn) will cause prices for corn to drop. Hmmm??? This story in the Sacramento Bee says that corn prices are at an all time high, yet not high enough for most farmers to plant corn for conversion to ethanol. Then again, it also says prices are high enough for ranchers and such to grow corn to reduce feed costs. Hmmm??? As much as I like corn, I hate to see it taking up more and more farm space. It's not the best thing to grow in regards soil health. "...the best kind of government is one you would be happy living under even if your worst enemy won the election. " I was surprised to hear that Eureka's Hancock's Fabrics is going out of business. Damn, that Marina Center's already driving our local businesses into the ground. But seriously, here's a case of a relatively new chain store that lost out to a pretty old chain store, JoAnn's Fabrics. I figured there'd likely be more than enough business for the two of them. After all, we have umpteen of those little coffee shacks in town. Couldn't Eureka and the rest of the county keep two fabric stores in business? The wife had to think a bit but finally said that while she'd probably prefer JoAnn Fabrics to Hancock's, she shopped at both. Oh well. Just another big box/ chain store to add to the list that have gone by the wayside in Eureka along with Pay n Pak, Montgomery Wards, J.C. Penny's....the list goes on. Oh; and what happened to all the Circle K and 7-11s we used to have up here years ago? In an almost startling turnaround of alliances, former arch- conservative Congressman, Bob Barr has signed on as a lobbyist for the Marijuana Policy Project. I say startling because it wasn't just a few years ago he described MPP's Executive Director, Rob Kampia, as "evil". He was also the driving force behind an effort that suppressed the vote count in a District of Columbia medical marijuana initiative. I say almost because it seemed almost as big of a surprise a little while back when Barr was appointed as the Southeast U.S. representative of the Libertarian National Committee, so it's not like there wasn't earlier signs of change going on. Still, hard to believe such a drastic change in attitude in such a short period of time. I imagine he might well have always had that libertarian streak in him. Maybe it just took losing his seat in congress to give him a chance to let his hair down and take a more objective look at things. Hanging around with other libertarians no doubt helped as well. Kudos to Greg Conners for the link to the news article. I'd actually got word of this earlier yesterday on Radly Balko's blog, but Balko didn't provide a link to anything but some Reason forum at the time. First it was Mckinleyville, now it's Blue Lake. They want to follow the lead of Arcata and Eureka in adding fluoride to their tap water. It never ceases to amaze me how some people are so insistent in shoving things, in this case literally, down other people's throats. I remind all that I'm not one that believes fluoride in the water presents any substantial health risk by being in drinking water. I just believe that should be a personal decision. Like Dana Silvernale, quoted in the article, I don't believe in medicating people through the water system, especially against their choice. Whoever would be the one to add fluoride to Blue Lake or Mckinelyville's water, they'd obviously know where to buy the bulk fluoride. Why not get a list of people that want to drink fluoride, have everyone pitch in a buck or two and go buy a big bag of the stuff. You could put the bag of fluoride at City Hall or the local water district and people could come by, scoop some fluoride up into a jar and take it home. Then those interested in having fluoride in their water could add it themselves- to their heart's content- and those who don't want fluoride don't have to deal with it. Isn't that a great idea? That should please all sides. Community leaders in Blue Lake and Mckinleyville; Make it happen! We've heard a lot over the last few years about how our local government employees, law enforcement in particular, need to be paid more to keep them from moving to other departments. Looks like The Governator is doing his part in that regard as well. He's decided to raise the pay for many of his department heads to make those positions competitive with similar positions in local government. So the vicious circle widens. What we'll likely see next is an effort by other state employees to raise their pay along the same lines. Next, local governments will try to raise their employees pay to keep up with the state employees. In a few years the situation will reverse itself with the state trying to trump local pay again. This sort of one- upmanship will never end and everyone, except for the government employees getting the raises, will suffer for it. Good thing I didn't speak too soon. A couple days ago I was going to mention that the weather folks had a severe weather warning out for this area and south to Novato. Didn't look like it was going to happen so I thought it might be a case of the weather service hyping the forecast just to cover themselves. This is pretty nasty. They say we could get wind gusts up to 50mph. I've heard my electrical equipment clicking in this room twice over the last hour. That means the power might be going out. So far it hasn't. Glad I have a battery back up for the computers but that only helps you shut down the computer properly. Please don't let the power go out. How will I entertain myself if the power goes out? Might I actually have to do something like clean the house? Let's hope not. Oh, supposedly a hard freeze warning tonight so insulate your water pipes. According to Tony Smithers of the Humboldt Convention and Visitors Bureau, people are " coming out of the woodwork" in support of his idea for designating the county a National Heritage Area. The only two people mentioned in the article are representatives from the Northcoast Regional Land Trust and Humboldt Botanical Gardens Foundation. Figures. I guess it makes sense the Sell- Trinkets- To- Tourists crowd would have their day. There's nothing else going on here. We might well be doomed to survive on the grants that seem to be more and more acceptable to the type of people living in Humboldt now. Then again, there's that wind farm project being discussed for the Lost Coast area. Hard to see how that will be of economic benefit to everyone, but it is something positive being considered. Let's see how many people end up objecting to that. Well, the Times- Standard guessed right again. They figured I might want to comment on a short story in their paper today on traveling to San Francisco back in the days of old. They were right. I did want to comment on it so they didn't put the story up on their web page. But all is not lost. The story did include a link to the Humboldt Historical Society web site. Being a bit of a history buff, how did I miss that site all these years? Looks like the story I was interested in today is one of the articles that Susanne Forsyth, editor of the Humboldt Historian, submits each month. They haven't updated their page yet to include the story I read this morning but here's the one from last month. I got excited when I saw a link to the Society's periodical, the Humboldt Historian. I used to enjoy reading that magazine years ago. A friend at work used to bring them in for people to read. Boy, now I can read that magazine again! I ended up disappointed as the link just leads to a list of stories in the current issue. No good reading to be found online. I guess I'll have to join the Historical Society one of these days if only to subscribe to their magazine. Not quite sure what to make of Dave Stancliff's My Word piece on blogging in today's Times- Standard. The first thing I'm wondering is how many readers know what a blog is? Sure, I know all of us do. The Times- Standard has also addressed blogs at one time or another so I would think most readers might have a rough idea of what they are, but I still wonder how many people would know what Dave is writing about. I run into people all the time that don't know what a blog is and still don't seem to understand after I try and explain it to them. When you call up this Web site you now get a blog listed below it. -that web site being North Coast Stand Down's web site. I don't see any blog listed at the bottom of their home page. Am I missing something? Oh, by the way, Dave: You got the url wrong for the Stand Down web page. It's www.northcoaststanddown.org, not www.northcoaststand.org. Faculty members of the California State University system are threatening to go on strike. Being on record as no friend of the Education- Industrial Complex, I say who cares? I don't. Still it might be fun to have the strike go forth and see how many people, outside the news media, actually notice. Tibor Machan doesn't think government employees should be able to go on strike. When and where's the fire? Reading about this fire in the Pine Hill area of Eureka kind of threw me. The Times- Standard said the fire was reported just after 7am today (Thursday). Hmm.... seems to me the paper was on my front lawn before then. The Eureka Reporter must have it right. They say it was on Wednesday. I can't be too hard on the Times- Standard. When I read the fire was on Thursday, I started wondering if today was Friday. I'm a bit disoriented to exactly what day it is myself. Now I'm trying to figure out what house was burned. I do three places right near there- the 400 block of Madison Avenue. The picture doesn't ring a bell. I'm thinking, since one picture shows a solid wood fence on at least one side of the house, maybe that's the house on the corner of Union and Madison? I don't know if those folks have chickens as alluded to in one of the photo captions, but they do have goats. Shame if it was their house. I'll find out either today or tomorrow when I go up there to work. Looks like another effort to legalize the growing of Cannabis Indica(? ), better known as Industrial Hemp, is back in the works again. According to the Contra Costa Times, this looks like an even more bipartisan effort than the last one- that one having been vetoed by the Governator. Looks like our our very own assemblybabe, Patty Berg, co- authored the bill. Good for her. And, once again, past gubernatorial candidate, Tom McClintock has entered the fray on the pro- hemp side. If someone can get the Governator to dump his "I'm only protecting potential hemp growers by vetoing this bill" attitude, this bill should make it. He's the only one that stopped it from passing last time. I'm wondering just who the behind the scenes interests are that are opposed to legalization of Industrial Hemp? That's at least two press endorsements for Mendocino County D.A. candidate, Keith Faulder, with the Santa Rosa Press- Democrat endorsing him today and the Ukiah Daily Journal endorsing him last week. An unfortunate event for Meredith Lintott since the Press- Democrat endorsed her last time around when she was running against the late Norm Vroman. I wonder how many people noticed we haven't had a head librarian in the county for the past eight months? I sure didn't. Even if I had, I'm not sure I would have cared. This certainly seems to illustrate what a lucrative business government is. Over $89,000 a year and that isn't considered high enough to attract qualified applicants. I would kill for that kind of money. The Sacramento Bee has some tips today on steps one might take if they're facing problems with their home mortgage. Not sure just how much they will help everyone but they might be worth passing on if you know someone in such a situation. As always, if asked for a login, you can use humboldtlib for the username and blogspot for the password. Check out this wireless hotspot web site I bumped into. It's supposed to be a directory of wireless hotspots around the world. Funny thing is, it just has cities listed by name with no reference to what country the city is in. Of the two listings for Eureka, one is for Eureka in Humboldt, the other is from somewhere else. So, I decide to add some of the hotspots for Eureka listed on the HumboldtHotSpots web site. Of course, that site doesn't seem to be working right for me either. But, I take two; City Barber Shop and Eureka Chamber of Commerce, and try to add them to the other directory. Funny, that the hotspotflare web site is supposed to be international yet it doesn't have a field for State when you try and add a hot spot. It has a field for SSID. What's that mean? Anyway, I press the Submit button and a small window opens from Firefox saying I'm about to open an html file and how do I want to open it or do I want to Save It To Disk. What's that all about? I tried the various options and all I get is some Page Not Found type of page. Anyone else want to give it a try? Let me know if you can get it to work. Both the Sacramento Bee and the Times- Standard take a look this morning at the aftermath of the housing market boom coupled with the mortgage lending practices that developed from high housing prices. The chickens came home to roost and many people are finding themselves in trouble not being able to afford the loan payments. This comes as no surprise to some of us. One state legislator is considering legislation to supposedly prevent at least some such occurances from happening in the future. Whether such legislation would help or hurt the situation, I'll leave to judge later. I was driving through Eureka the other day and it seemed like there were more homes than I'd seen in a while up for sale. Don't know if it's just me. Maybe there's no more for sale than usual. Still, I couldn't help but wonder if some local homeowners are trying to get out from under a difficult situation? Certainly some are as the Times- Standard mentioned there are 161 homes in Humboldt under some stage of foreclosure. That doesn't sound as bad as I would of expected, though. I wonder if that's about average? UDJ Endorses Faulder For D.A. I just noticed the Ukiah Daily Journal has endorsed the past Mendocino County District Attorney's right hand man, Keith Faulder, for that seat. They seem to take issue with one of Faulder's opponents, Meredith Lintott, because she opposed the current special election- the election itself being a result of a court decision. The Journal suggests Faulder was proven right after all was said and done. Well, I've said it before and I'll say it again: Just because a court rules one way or another doesn't necessarily make it right. It just makes it law. It's good to see all the county and city fire districts have ironed out some kinks in their mutual aid procedures. Still, a bit of a surprise as I'm sure most of us weren't aware of any problems in that regard to begin with. I find this pretty wild, if only because I know one of the two "new" cops hired by Eureka P.D. Gary Cooper is an old National Guard buddy of mine. He was a Eureka Police Reserve officer for quite a while but was never able to get hired for some reason. The Sheriff's Office hired him, eventually, and he's worked there for years. I was under the impression he was fairly happy with the Sheriff's Office. I'm dying to ask him why he chose to return to Eureka P.D. I suppose I shouldn't have long to wait since he works in Eureka now. I'm not sure this will be much of a boost in manpower, though. Gary is- last time I spoke with him anyway- the Platoon Sergeant of my old National Guard unit: Det 1, 870th Military Police Company. Last time we spoke, he said he was looking forward to an upcoming tour in Iraq. You still going there, Coop? Then again, I don't recall just how long ago that was. Maybe he decided to retire from the Guard? He had enough time to. Can't wait to ask him. With a new police chief being chosen for Eureka, it will be interesting to see how long he lasts. I could be wrong but it seems to me the ones Eureka hired from out of town in the past only hung around a few years. Then again, doesn't seem like the ones we hire from within the department last all that long, either. I don't remember who the chief was when I first moved up here in '73. The first one I have memory of is Ray Shipley who, although I forget his exact period in office, was chief when I went through the Redwoods Police Academy. He moved on to become Chief of Police in Portland(? ), Oregon, if memory serves me correct. Will this new guy end up doing the same? Interesting story on this new Eureka cop in today's Eureka Reporter. I was surprised at the statistics in the article showing only 13 out of 41 of Eureka's sworn police officers have prior military experience. I would of thought it would have been the other way around. Eureka Now In Third Place? In average statewide gas prices, that is. According to a recent survey, Eureka is no longer the leader in high gas prices in the state. We're in third place following San Francisco and Pleasanton. I've always questioned the statement that Eureka always has the highest prices. As I mentioned before, I saw prices at some stations in San Francisco that were considerably above what we pay here. Nationwide, seems to me that Hawaii generally is up there in the top as far as gas prices go, as well. Then again, they're talking average prices, and it would be hard for someone to easily figure those out. That's probably all part of The Conspiracy: They're just trying to keep us confused. Just noticed an announcement in the Arcata Eye telling us our very own Hank Sims is starting off his own radio show, Humboldt Review, on KHUM tonight. Interesting we heard about it in the Eye and not in the blogosphere. It gets even better: His show runs from 6 to 7pm and Eric's show, All Things Reconsidered, follows on KMUD from 7 to 8pm. Boy, if everyone keeps starting up radio shows, will there even be a need for blogs? California often follows. We're talking about banning trans- fats in the state following New York City's example. Will we do the same with New York's most recent ban? Thanks to Homeland Stupidity for the heads up on this one. Wow. Only 4% of Mckinleyville residents responded to this poll. If someone sent me a poll asking some of the things that poll asked, I'd be sure and fill it out and return it if only to counter someone else who sent one in who might have felt the opposite way I did. I wonder what the mailer looked like? Could be a lot of people thought it was just junk mail? Our very own Bob Morse appears in the Times- Standard this week writing the weekly Tech Beat column. It's pretty much an expanded version of the March 4 post on his Talking Tech blog. The one thing missing in regards to all this talk of the newspapers going online, as we discussed here not too long ago, is how are they going to make enough money online to pay their reporters? That remains to be seen. As Eric notes on his blog, candidates in the Mendocino County District Attorney's race participated in a public forum last week. They'll be having a special election for that seat next month. As I mentioned on both Eric and Ed Denson's blog, I managed to catch the candidates on a radio broadcast forum last month while driving through Mendocino County. One thing I appreciated, as far as how they ran the forum, is the two male candidates- Faulder and Schlosser- always identified themselves before they'd speak. Before saying anything else they'd always go, "This is Keith Faulder...". That made things a lot easier to follow. I remember some years ago one of the few times I listened to Thursday Night Talk. What station does that...KHSU? There were four or five guests doing some sort of discussion, including one I knew personally; Kevin Bastian, the Libertarian Party candidate for Congress at the time. For the life of me I couldn't tell who was saying what the whole show, even when Kevin spoke, as no one identified themselves before speaking. So, just a suggestion for any of you radio folks out there: Figure out some way for listeners to tell who's saying what on those types of shows. Not to beat a dead horse but maybe I'll change my mind on global warming. It's really warm outside today. I can't remember it being this warm in...how long? Global warming must be true. Thanks to CLS, over at the Classically Liberal blog, for the heads up on this one: The Great Global Warming Swindle is now available on Google Video. That being the british documentary I mentioned here a short time ago which was billed as a counter to Al Gore's An Inconvenient Truth. Will any of the U.S. television networks run the show? My guess is they won't, especially having seen something in the Times- Standard's Entertainment section the other day about An Inconvenient Truth going to be aired on one of the U.S. networks. Seems to me, it might have been the Discovery Channel that would be running it. I might be wrong on that, though. Interesting, and actually somewhat frightening, to me that they'd release Gore's flick right after the airing of The Great Global Warming Swindle. Suspicious timing as I see it. Are we worried about an opposing view getting some attention? One thing that strikes me about this Global Warming issue is the zeal, or determination, with which the environmental movement is pushing man- caused global warming. Ooops...it's Climate Change now, isn't it? I can't help but see a parallel between the man caused climate change campaign and the build up to the invasion of Iraq. Back before we invaded Iraq, we were given all kinds of reasons for attacking Iraq, via the powers- that- be. There must have been a dozen arguments thrown out for attacking Iraq hoping that everyone would accept at least one of them. Arguments in opposition were either downplayed or ignored altogether. Seems to me the same is happening with this Global Warming issue going all the way to the point where it's being renamed Climate CHANGE so just about any weather phenomena can be attributed to supposed human effect on climate. I would think the zeal with which the Global Warming crowd is pushing the issue, it being along the same lines of our march to war with Iraq, should give even environmentalists cause for concern. I'll be the first to admit to having little patience with some of the criticisms commentors on the Humboldt blogs make against local newspapers and their reporters. Many of those criticisms often seem to come from nowhere and I can't help but wonder if they're simply made by people who have nothing good to say about anyone anytime. I think most of you know the types I'm referring to: People whose only comment(s) insults someone for reasons that aren't often clear. We've seen plenty of such comments right here. That said, I've found some of the past dueling between the Eureka Reporter and Times- Standard of interest. I've even found it amusing at times. Now I'm thinking it might be getting out of hand, at least if this keeps up. Once again, charges of unethical conduct are leveled. This time against the Times- Standard by the Eureka Reporter. Regardless of the merit, or lack thereof, of such charges, I think it would be in everybody's best interest for the papers to just stick with publishing their own paper and stop the finger pointing. Eeeenough! Leave the finger pointing to the Humboldt blogosphere. Boy; I'm getting to think getting more commercial use out of Humboldt Bay is as much a pipe dream as re-establishing rail service to Humboldt. Not only has shipping volume dropped significantly over the years, now it looks like it will be even costlier to dredge the bay- perhaps to the point of being prohibitive. Unlike the idea of rebuilding the railroad, which I think is not just a pipe dream but silly under any foreseeable circumstances, I would like to see the bay used more. It doesn't look like that's going to happen. "When Gov. Gray Davis left office in 2003, California state government spent $8.80 for every $100 of personal income. Today it spends $9.54......"
"Over the last three years, while general fund revenues have grown 23 percent, spending has grown 30 percent -- significantly faster than it did under Davis." To read more, go here. As always, if asked for a login, you can use humboldtlib for a username and blogspot for the password. In the case of a proposed curfew of the Eureka Boardwalk, one wonders if it's just a few people. The Old Town area of Eureka has been a magnet for riff- raff since time immemorial. Most every town has its own Skid Row, and probably always will. The Eureka Reporter story on the curfew proposal makes it sound to me like it's almost a done deal. The Times- Standard story this morning made it sound like there's a little more ambivalence on the issue by those involved. Unfortunately, I didn't see the story on the Times- Standard web site so I can't provide a link. It's on the front page for those of you interested enough to go buy a hard copy. Interesting that many seem to think the problems on the Boardwalk during the daytime seem to be worse than those at night, yet some still propose a night time closure, at least temporarily. What I find scary is the sentiment some have as a gal quoted in the Times- Standard story. She had a "Why not?" attitude about the curfew and seems to think anything we can do to reduce crime is a good idea- whether its effective or not. No consideration seems to be given in regards to individual liberty. If that sort of attitude keeps gaining acceptability we'll all likely be under some sort of curfew eventually. So, curfew or no curfew? I'll leave it up to others to worry about. Seems to me, though, a curfew won't make the people causing the problems disapper. They'll just do the same thing somewhere else. I see Democracy Unlimited is having one of their anti- corporate power events this Saturday. Am I the only one that finds it odd that neither David Cobb or Kaitlin Sopoci- Belknap are mentioned in the announcement? Also interesting that they don't mention where the event will be held. How long ago was it I was ragging on financial institutions for their service charges on bounced checks? Was it this year or last year? I received in the mail yesterday something from my credit union, Provident Central Credit Union, notice of a new program they've started. It's called Courtesy Pay. This seems to be a replacement for getting dinged $20.00 or more from each bank involved when someone bounces a check. My complaint wasn't just the service charges but the fact they didn't even cover the check. Courtesy Pay seems to do away with that although you still pay the big bucks. Thing is, they cover the check and charge you $20.00 for covering it. Then you have to pay up as soon as possible. All of this depends, the mailer says, on you keeping your account active and managed responsibly. In other words, if you're one of those that's constantly bouncing checks and has an average balance of $10.00 in your checking account, you don't get to use Courtesy Pay. For some reason I had to think for a second as to whether this was a good or bad deal. Sounds to me like it is an improvement if only because the credit union actually covers your check thus letting you avoid being responsible for the overdraft charges the receiver of your check has to pay. Still, $20 is pretty high interest. All that said, I don't think I need to worry about it as I have overdraft protection which ends up being much cheaper than paying $20.00 for one check. Those of you that don't have such protection might check and see about it, or see if your bank or credit union offers some sort of Courtesy Pay program. I'm wondering if this will be an industry wide change or just Provident Credit Union's? I actually saw this car in Henderson Center, Eureka, the other day. I was right: It was one of those Smart Cars. I'm surprised I haven't seen it more often as I believe the owner has an office just a few blocks away from where I saw it. The one thing that bugs me about little cars like that is I'd be scared to death of getting hit by just about anything in one of them. Heck, seems like even having a motor scooter run into you would ruin the car and maybe even kill you. Anyone know how much one of those things cost? This guy's opinion piece in the Eureka Reporter had me going this morning. I couldn't figure out what point he was trying to make until right at the end. At first I took him to be a life long government devotee, having served in the Peace Corps and then taking a job with California State Parks. Then, at the end of his piece, he credits all the improvements he witnesses in Thailand to capitalism, not government. Who'd a thunk it? As one of the reporters for the Eureka Reporter pointed out to me a while back, it's surprising how many libertarians have government jobs. Hey, I thought that might be the perfect title for this upcoming effort at counterspinning Al Gore's so- called documentary An Inconvenient Truth. But, I suppose The Great Global Warming Scandal is a good a name as any. At this point it seems it's only being shown on british television but maybe since the Washington Times ran a story on it today some U.S. Networks may want to air the show as well. If not, I used to be able to watch BBC shows every now and then on C- Span. Wonder if maybe C- Span will run it? Then again, I never watched Gore's flick so, in the interest of fairness, maybe I should pass on this one? That, of course, assumes it gets shown in this country to begin with and, with this show being as politically incorrect as it is, it might have a tough row to hoe trying to get airtime in this country. Interesting article in that tabloid that accompanies the Times- Standard on Sundays. USA Weekend had an article on longevity. Basically that's how long people are expected to live. I'll admit to not really reading the article, but I did read far enough to find out where the test was that they determined longevity by. So, I headed over here and took the test. I actually couldn't take it yesterday as the web site got overwhelmed with everyone trying to take the test. It was slow, slow, slow, so I finally gave up. It worked well enough this morning, though. You'll notice there's two separate tests; one for those over 49 years old and one for under 49. My longevity is supposedly 74 years old. That seems a bit optimistic to me as I figured the test would show me as already dead. One cavaet: At the end of the test, before you get your test result, you have to sign up as a member of their site and supply an e-mail address, username and password. It would be fun to see a housing development of these houses. 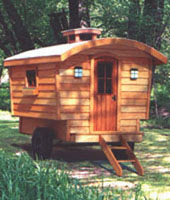 Though small, they certainly seem affordable, especially if you build it yourself. Not sure they'd would work well for more than one person. I suppose it would depend on who the second person is. I think I could handle living in one. Found out about these houses through that tabloid the Eureka Reporter includes on Sundays- American Profile. The Sacramento Bee has yet more discussion of the proposed ban on incandescent lightbulbs this morning. As usual, if asked for a log in, use humboldtlib for the username and blogspot for the password. That's what the county gave our recently departed county counsel? I'm just dying to know what that's all about. I've ragged on Get Out The Vote campaigns here before. Now, some of our best and brightest in Sacramento have decided to make registering to vote a requirement for graduation from high school, the Ukiah Daily Journal reports. if you are forced to vote and you don't have enough interest to vote in the first place, you probably don't have enough interest to be informed and make a sound decision,"
As far as I'm concerned that's well said. I'm surprised, and pleased, to see them reference the Libertarian Party of California and an LPC spokesman in beginning the story, although I don't believe I've heard of Fred Foldvary before. Since my latest travelogue is over 4000 words, I thought I'd post it on a separate page. No, I'm not putting it somewhere else because of some anon's complaints. It's just too long (like some of the others I've done) and I don't want the travelogue to bump other posts off the front page of the blog because of its length. Feel free to post any comments related to it here, though. Now here's an idea for all you frustrated writers out there: Head to Del Norte County! There doesn't seem to be much of a news presence up there. This might good be a golden opportunity for a lucky, hard working, aspiring reporter. Heck, you could start out with a news web page like Charles Douglas and the now defunct Humboldt Sentinel. I realize that one went down the tubes when Charles pooped out on that one, but it had potential. Besides, he had any number of local media to contend with. Keep in mind the Eureka Reporter started out as online only. Look at it today. How about it, Nick? What about all those anons out there with nothing but complaints in regards our local papers: Want to show us how its done? First one to get up there has the advantage over everyone else.